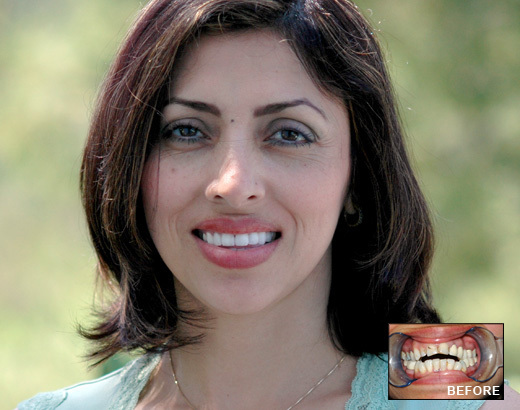 Call Now at (949)215-4400 to schedule your complimentary personalized Smile Makeover appointment with one of our dentists or e-mail your request here. Every new cosmetic case goes though a thorough analysis and personal evaluation by Dr. Nguyen or Dr. Yang to help a patient determine the right color, size, and shape of restoration for each individual. How white, how long and what shape the restorations should be is determined by analyzing the individual's skin quality, size and shape of the face, and lip structure. 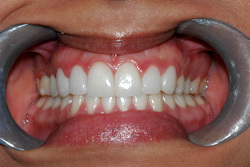 The upper six teeth are Dr. Nguyen's custom designed veneers. The rest are Anette's natural teeth. 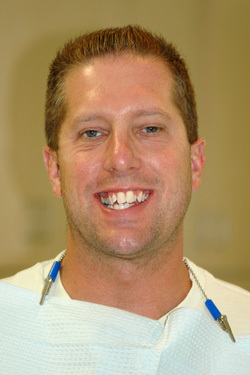 Notice how natural the dental work is. With Dr. Nguyen's guidance and Anette's preferences, the most suitable color and shape for veneers were chosen to suit Anette's skin color, face shape and lip features. 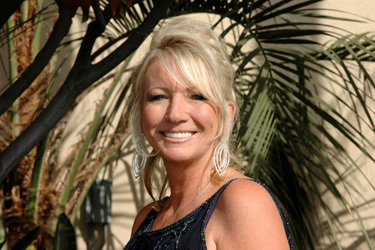 Anette reports that no one besides her close friends knows that she has porcelain veneers and she constantly receives compliments on her smile. 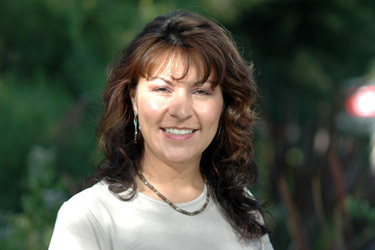 Anette now has an offer to model her teeth for a major teeth whitening company. 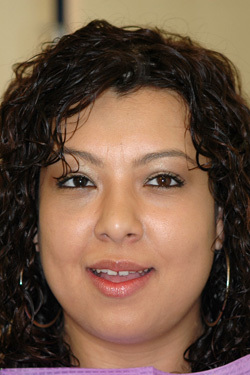 Theresa had Dr Nguyen replace only TWO old crowns. Can you tell which TWO? Try not to look at the "Before" picture. 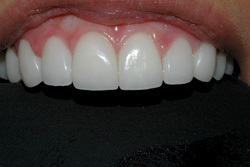 It is difficult to tell because we went though a custom color and shape procedure to match these highly aesthetic crowns to the color and shape of the natural teeth. Do you have crowns that do not match? Dr. Nguyen can help you. 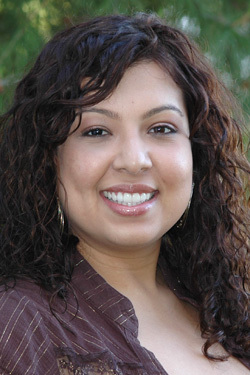 Claudia had four upper Lumineers™ placed to correct her discolored and mis-shapen teeth. 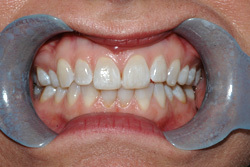 These Lumineers™ were placed in two short appointments. 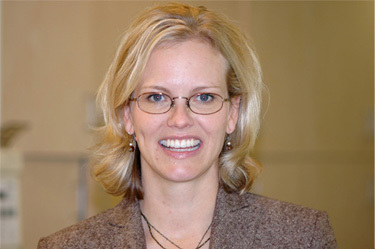 Sarah had six upper full porcelain aesthetic crowns placed. 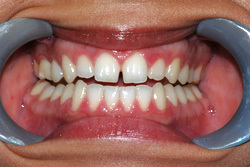 Pam had six upper custom veneers placed to correct her two missing lateral incisors. 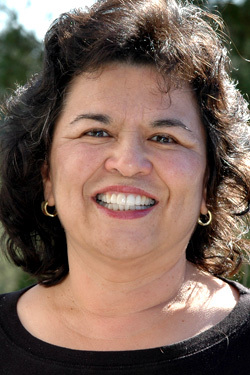 Sandra had six upper veneers placed. 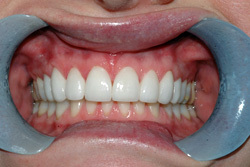 She did not like the shape of her teeth and wanted whiter teeth. 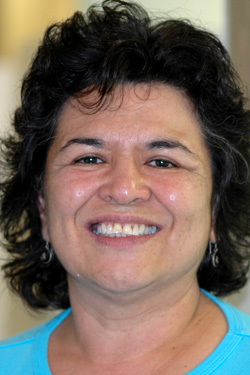 Linda had ten upper and ten lower veneers placed to correct her discolored, crooked teeth, and receding gumline. 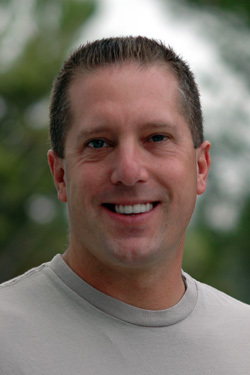 James had six upper veneers placed to correct his crooked and mis-shapen smile.